Here’s my assignment for the Astral Travel course I’m taking (organized by Pagan Pages). Butterflies out of the Body is a guided meditation I wrote to facilitate astral travel and the separation of the etheric body. The meditation should be changed to suit your personal needs. I have not yet tried it, but will do so as soon as I get the chance and then I will also make the necessary adjustments if necessary. I will start by breathing slowly and deeply and by relaxing every muscle in my body from the top of my head to my tones. Breathe in 1-2-3-4-5 and as you exhale, think RELAX. You are surrounded by clouds. Feel the texture of the clouds. They are soft and light, they do not choke you, but gently brush by you. They are thin as air, soft as a feather. Breath in 1-2-3-4-5 and as you exhale, think RELAX. The clouds are wispy and they are drawing apart. They are softly swirling around you. Every cloud is a different pastel colour. Slowly they evaporate until you are surrounded by mist. The mist is soft and liquid like water. It is all around you. Slowly it changes colour. You are floating in the mist. Above you the mist draws apart. You see a group of vividly coloured butterflies flying towards you. Take in the different colours. The energy and yet the silence of each one. They softly brush down upon you. You feel the almost unnoticeable weight of each butterfly as they land on your hands, your arms, your tummy, your legs, even your toes, your hair, your forehead. You are covered by butterflies. 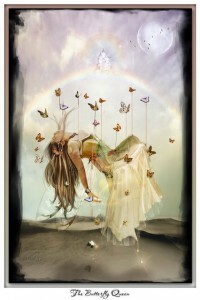 The weight of the butterflies allows you to sink even deeper. Then, as one, the butterflies rise up. They pull you up with them. You feel yourself being slowly lifted. First your fingers and your toes are pulled free, then your arms and legs, your head and finally your abdomen. As you are being lifted higher and higher, you leave your physical body. Your physical body is still floating on the mist. Previous Conversing with the Cards – The Major Arcana: The Fool Next Introductions ‘Episode’ is up! ..it strikes me how amazingly detailed this is, my sister! It may not seem detailed to the quick passer-by, but I see it happening as I’m reading it. It’s as if I’m in both worlds; the physical and the esoteric worlds at the same time. This feeling of lightness and freedom accompanies me through this and every moment to come.